Barclays promised it was "changing" after being fined £290m last year for its role in the Libor-rigging scandal. But it has just awarded its investment bank chief Rich Ricci £17.5m and CEO Antony Jenkins £5.3m. Ricci’s payday was dwarfed by the £44m he collected in 2010. 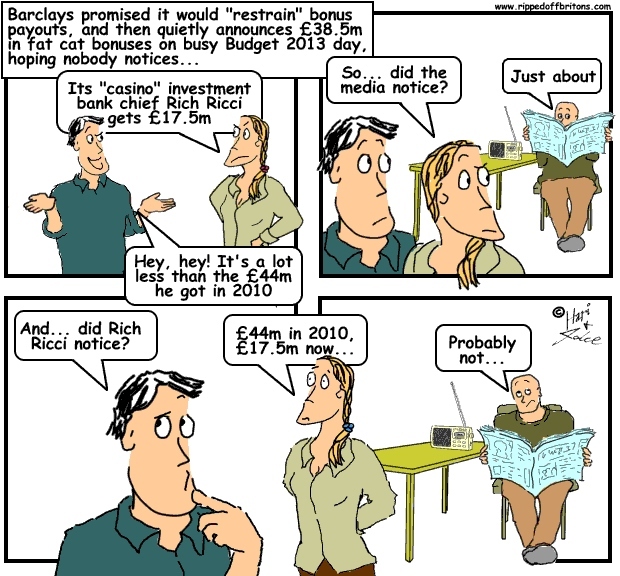 Barclays were accused of sneaking out its news on budget day, in the hope that the media wouldn't notice. Do high pay and bonuses encourage high performance and excellence? A US Federal Reserve study says high reward actually results in worse performance! Ricci was there during the LIBOR and PPI scandals and is therefore getting bonuses that are from the proceeds of crime. Time for direct action is getting very close. If the government condones this behaviour can it claim the moral high ground and impose legal sanctions on someone who torched Ricci's home or poisoned his beloved horses. The outcome is inevitable when government allows one class to shuck off its legal and moral obligations anarchy is inevitable. Ricci and bis cohort should be afraid, very afraid. I agree on the majority of your comment, particularly when you talk about direct action! I'm constantly angry about the criminal banksters who're enabled by progressive governments. But I don't agree with attacking the horses owned by crooks (or any other animals), as they are slaves and don't have the choice where they are sent!